Description: This solitary stony coral has a low cylindrical corallum, with a spongy and fragile texture, up to 15mm in diameter. 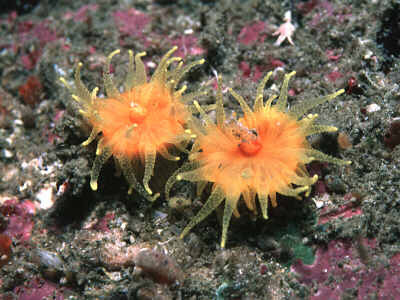 The polyp is a rich yellow or orange colour, often with a scarlet disc; there are probably no more than 48 tentacles spanning up to 25mm. 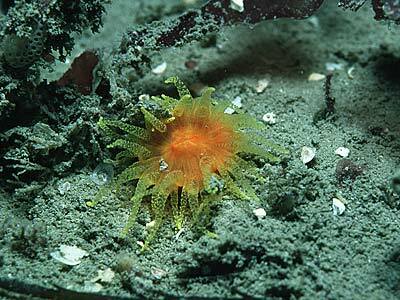 Habitat: Found attached to rocks in crevices, caves and other sheltered places; from the lower shore to about 25m depth. Distribution: Found in extreme southwest England and Wales and perhaps Ireland, rather local and uncommon in the British Isles. It has also been recorded from southwest Europe and the Mediterranean. Similar Species: Leptopsammia pruvoti is usually tall and generally larger, with up to 96 tentacles which are less translucent. Spongy, fragile texture of corallum. Picton, B.E. & Morrow, C.C. (2016). Balanophyllia regia Gosse, 1853. [In] Encyclopedia of Marine Life of Britain and Ireland.